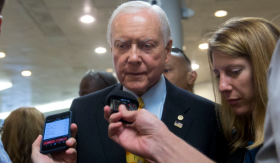 U.S. Sen Orrin Hatch, R-Utah: Senate looking at VW for "possible fraud and abuse related to federal tax credits." WASHINGTON (Reuters) -- Top senators on the U.S. Senate Finance Committee are investigating Volkswagen's actions related to federal tax credits designed to reward consumers for buying environmentally friendly vehicles. The move by Senate Finance Committee Chairman Orrin Hatch, a Republican, and ranking Democrat Ron Wyden was conveyed in a letter to the automaker dated Oct. 6 but made public today. It comes after the company admitted that it used a software trick to show false, "clean-burning" diesel engine performance in some of its models. Noting that the Senate Finance Committee is authorized to investigate "possible fraud and abuse related to federal tax credits," Hatch and Wyden gave VW until Oct. 30 to provide information related to the eligibility of the company's vehicles for a "lean-burn technology motor vehicle" tax credit. The letter was sent to VW CEO Matthias Muller and Michael Horn, president and CEO of Volkswagen Group of America. In order for consumers to get the tax credit, car manufacturers had to certify that their vehicles met certain fuel economy requirements and complied with emissions standards. VW has admitted installing software in some of its models in order to make vehicle emissions performance appear better in testing than during actual driving conditions. Horn and federal environmental officials are set to testify on the matter on Thursday before the House of Representatives Energy and Commerce Committee. Hatch and Wyden noted that in 2008, VW certified to the Internal Revenue Service that its 2009 Volkswagen Jetta TDI Sedan and SportWagen qualified for $1,300 in tax credits per vehicle sale. Other models were later certified and the senators said VW sold at least 60,000 of these vehicles by July 1, 2010. "Well over $50 million in tax subsidies went to purchasers of these vehicles, depending on the number of purchasers who claimed the credit," Hatch and Wyden wrote. Meanwhile, two senior officials from the EPA told U.S. lawmakers today that they cannot divulge new details about the agency's probe of Volkswagen without jeopardizing their investigation. In written testimony submitted to a House oversight panel ahead of a Thursday hearing, the EPA officials also said that VW concealed information about its ploy to cheat on diesel emissions after higher emission levels were discovered.